If the word mozzarella brings to mind only one type of cheese (the kind that's sprinkled atop your favorite pizza), then you haven't discovered all the different types of mozzarella in the cheese case. From fresh to smoked and from cow's milk to mozzarella di bufala, there are many different types of mozzarella to enjoy. Mozzarella is a stretched curd cheese that originates from Italy, though most mozzarella sold in the U.S. is made domestically. The fresher the mozzarella, the better it tastes. If you can, try to buy from a local cheesemaker or learn how to make your own mozzarella at home. Creamy, milky fresh mozzarella is mild flavored but irresistible. Fresh mozzarella is sold in small plastic containers or bags filled with water or whey. Once opened, the mozzarella should be eaten within a few days—and the sooner the better. Fresh mozzarella is sold in several different sizes. Mozzarella balls are about the size of a small orange. 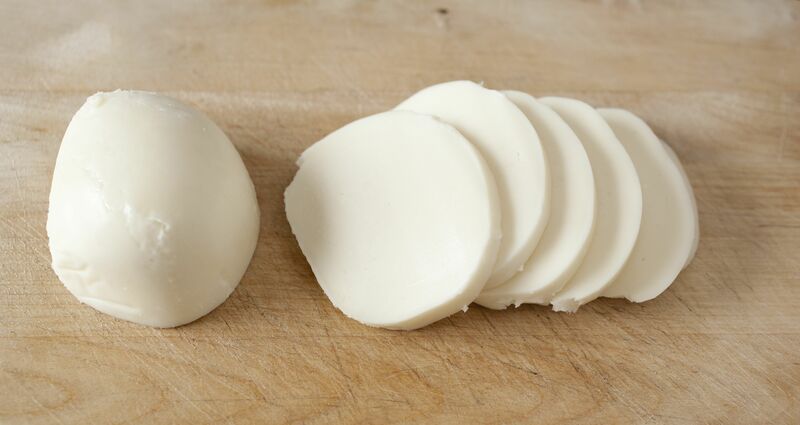 Bocconcini cheese is formed in slightly smaller balls (about the size of an egg). Ciliegine mozzarella is smaller still, about the size of a cherry. Sold in a tight plastic wrapper without any liquid, processed mozzarella has a texture that is firmer and more rubbery than fresh mozzarella. The flavor is very mild and a little bit salty. Because it melts well without becoming watery (although it can be quite stringy), mass-produced mozzarella is primarily bought to be used as an ingredient for lasagna or pizza. Di bufala means of the water buffalo, and it was the milk of this animal that was first used to make mozzarella. These days, most mozzarella is made from cow's milk, but mozzarella di bufala is still sold. It can be slightly harder to find and is usually more expensive. Water buffalo milk is richer than cow's milk, and you can taste it in this cheese. The flavor of mozzarella di bufala is a little bolder and a little sweeter with a slight grassiness. Burrata looks like a regular ball of mozzarella until you slice into it and a decadent center filled with thick cream is revealed. Tiny shreds of thin mozzarella curd are also mixed in with the cream. The result is a super-creamy version of mozzarella that's fantastic simply spread onto bread with salt and olive oil. Smoked and Paestum Mozzarellas at Obika Mozzarella Bar. All types of mozzarella—fresh, mass-produced, bufala—can be smoked. When mozzarella is smoked, the cheese might be suspended directly over wood chips or placed in a container or smoker of some sort that smoke can waft through. The type of wood chips used varies, though hickory, chestnut, alder, pecan, cherry, and apple are common. In most cases, the cheese is cold-smoked, a gentle process in which the temperature doesn’t exceed 100 F.
Smoked mozzarella has a brown, edible rind. The intensity of the smoky flavor varies with each brand. More like a cousin of mozzarella, scamorza is made in the same way as mozzarella but is a drier, firmer cheese. Scamorza is sold in the shape of a ball or pear in both plain and smoked varieties. It melts well and is less watery than fresh mozzarella.